Meet Rachel, our Social Media Ambassadors! Rachel graduated from Auburn University (War Eagle!) where she studied marketing. She is passionate about relationships and all things creative, which is what brought her to Imagine! Rachel will be supporting our Food and Beverage Pod. Rachel loves meeting new people and is incapable of walking past a dog without petting it. When she’s not working, you can find her having a game night with her friends, buying yet another book she probably won’t finish, or practicing calligraphy. Meet Katie, our newest Social Media Coordinator! Following her graduation from Kennesaw State University with a degree in Communications and a concentration in Public Relations, she was offered an opportunity in New York City where she worked in the fashion industry for just shy of 2 years. While Katie loved the fast paced city life, as an Atlanta native she knew those brutal northeast winters would definitely be bringing her back to “hotlanta” soon enough… but only for the perfect opportunity. Katie feels so incredibly lucky to have found everything she loves in one place at Imagine: social media, fashion/lifestyle and the comfort of being back in her home state - all while being surrounded by the most inspiring and creative minds everyday. If you can’t find her in the office, she’s either catching up on the latest runway trends, at the mall with her sister, Molly, instilling the most diligent shopping techniques in her 15-month old niece, Camdynn (gotta start ’em young) or convincing her friends and family to quit their diets and eat cupcakes + Zaxbys with her for every meal. She strives to be an encouraging and positive light in the lives of those she surrounds herself with and she strongly believes you can accomplish anything with the right mindset! 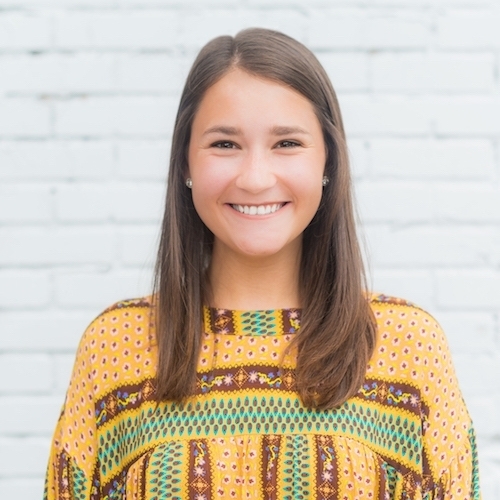 Meet Amanda – Mandy for short, comes to us from The University of Georgia studying Advertising with a Studio Art minor. She attended UGA with the intention of following her passion for creative work and business marketing, trying to find a way to combine them. Born and raised in Marietta, this suburban native dreams of working in the big peach city of ATL for an amazing company like Imagine Media. She loves staying busy by being involved at her work place in Athens, having a full schedule of classes, or creating work in the art studio. She has an adventurous spirit and loves trying new things! When not working, you can find her traveling constantly with friends to see live shows or to attend music festivals. She also loves hiking, eating out with friends, or making creative graphics for every occasion. Mandy looks forward to meeting creative and hard-working people like the amazing team at Imagine Media. She values those who are innovative, supportive, and have a free spirit. Being responsible for the decisions you make is something that is often instilled in you, but being accountable for your actions is a different story. Being accountable is described as admitting to those the things that you may not want to own up to, instantly. In a small company, you have to be willing to own up to any minor mistake you made. Just because you take ownership of that mistake doesn’t mean you will be punished or scrutinized, it allows you the opportunity to learn from it. For example: Inform people that you have a career in which you feel you can grow and mature and that you feel with this experience it will allow you to excel in many ways. Entering the workplace is extremely rewarding, especially if you’ve just graduated school. You have to understand that, while the paychecks clear the same, working for a small company versus Corporate America is vastly different. At Imagine Media Consulting, we possess an authentic startup culture. We have an open environment, which fosters collaboration and teamwork. Working for a startup does not mean you will always be in an office environment - you could be in a shared or coworking environment, such as Industrious or WeWork. Sometimes, explaining to someone that you don’t have an office or that you belong to a coworking environment can be tricky. An easy way to describe this is by letting the person know, you work in an environment that breeds collaboration. It isn’t as divided as a typical Corporate America environment, but there are specific areas to retire to if privacy is needed. Teamwork makes the dream work! Cliche’, but this is our mantra. We all dreaded the group projects during our last couple of semesters of college. It definitely taught us all how to collaborate and to keep the end goal in mind. Group cohesion is vital in the workplace, whether it is a small startup or a large corporation. Getting along with your peers, partners, and clients is a necessity to a successful business. By keeping an open communication, you allow everyone to stay in the loop. Sometimes, being consumed in your own projects can allow you to blow past a group objective without letting everyone else know. While you are definitely getting tasks done, if other people are involved in this project, it could cause the other person to miss something or even be left out of an important piece of that project. Examples of this could include -- carbon copying (CC) multiple people on an important email and allowing an easy flow of communication between the relevant people (text messages, Slack channel, or a phone call). As a small start-up company, we do the bulk of our custom work with the help of our own Imagineers. This includes photo shoots, graphic design, creating captions (copy), blog posts, and even GIF creation. Be mindful not to eliminate these tasks before they are even considered due to simply believing that there is no way you could put them on your resume. For example, if you modeled or took pictures on behalf of a partner you could consider that as being a brand representative or, depending on the duration, a brand ambassador. Just ensure that when wording it, you explain relevant details and tailor it to the overall objective of your resume. These details could vary from follower count to engagement. Have more insight on working for a small start-up company? Comment below, we’d love to hear from you! Knowing someone on “the inside” is so super helpful and informative. Meet Kasey, our new Sales Ambassador! She is a current student at Kennesaw State University, studying Marketing and Accounting. Kasey is a quirky go-getter who has a passion for meeting new people. With the recent influx of 54 million millennials into the workforce, company culture has a tremendous impact on what jobs are being sought more often.